Energy Saving LED Signs, Wholesale LED Signs - iSIGNS Inc.
All of our sign products are "Quick-to-Ship." All products are manufactured locally in Northwest Pennsylvania and ship to clients throughout North America. 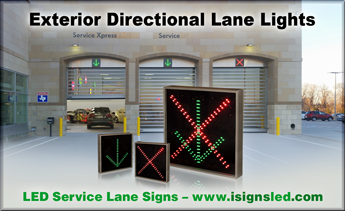 iSIGNS Inc. in Fairview, PA offers LED illuminated Exterior Directional Lane Lights (X | Arrow signs) to rev up and enhance the customer service experience. Automobile Dealerships and Service Centers install these signs as exterior entrance lights over their Service lane doors to draw attention to their Service facilities, direct traffic flow to open service lanes and speed customer check-in. When used with our toggle switches… at the flip of a switch, dealerships have the ability to open and close lanes depending on service needs or traffic requirements. The bright, highly visible LED messages are easily seen from a distance and direct motorists to the Service Entrance and vehicle drop-off lanes without having to leave their vehicles. These signs help to keep traffic flow organized and less congested. They also offer an element of safety for drive-thru service lanes when used to indicate directions for entering and exiting as well as displaying when a lane is occupied. Units feature slim-line cabinets with space saving super imposed images, energy-saving LED illumination that costs only pennies a day to operate, and a 5 year warranty. These signs are quickly becoming a facility signage requirement for many dealerships throughout North America. 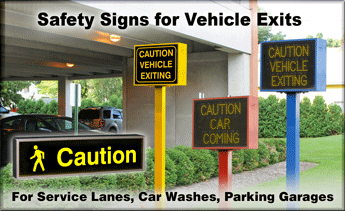 Improve the customer experience…put these signs to work at dealership service drives now! Learn more about Exterior Directional Lane Lights and LED Service Lane Signs. Helping the world go green one sign at a time! We are dedicated to recycling and using recycled materials, reducing waste, conserving our resources and re-using materials whenever appropriate. From energy efficient computers & monitors, to the use of eco-solvent inks, 75% recycled aluminum material and energy efficient LED illumination in our sign products; we set the example of living with greater environmental awareness and responsibility. All iSIGNS Inc. sign systems are manufactured in Northwest Pennsylvania….or as we call it “the North Coast.” We are proud to provide jobs in our community and to showcase the talents and abilities of the many great people who are the thread from which we weave our existence as an American company and sign source.